Talking to God is a natural human activity that does not require any special powers. What could be more natural than wanting to know the God Who created you and to Whom you will one day return? One day something will happen to wake you up. You will realize that you desperately need Him. This is Jesus telling you, "Come back to Me with all your heart." Let Him know how you are feeling. Don't hide anything from Him. There is no problem Jesus can't handle. Don't just pray for your relative or friend suffering from cancer, pray for everyone with cancer. Your prayer is more powerful when you pray for many people, instead of only one. 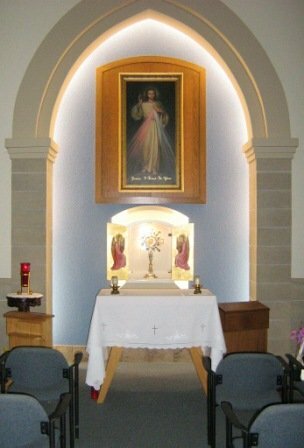 You are welcome to use the chapel in a Catholic church to pray in a sacred space. But you can also set up a prayer station at home or in another private place. 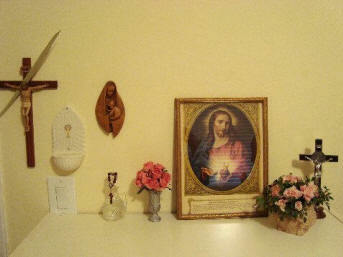 Place a crucifix on the wall and set up a small table with a picture of the Sacred Heart and one of Mary His Mother. Also place a Bible on the table. A chair and a kneeling pad would also be helpful. If you subscribe to a prayer site that provides you with daily prayers, you can set up a laptop on the table.